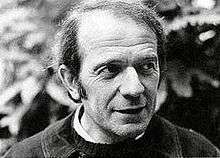 Gilles Deleuze (French: [ʒil dəløz]; 18 January 1925 – 4 November 1995) was a French philosopher who, from the early 1960s until his death, wrote on philosophy, literature, film, and fine art. His most popular works were the two volumes of Capitalism and Schizophrenia: Anti-Oedipus (1972) and A Thousand Plateaus (1980), both co-written with psychoanalyst Félix Guattari. His metaphysical treatise Difference and Repetition (1968) is considered by many scholars to be his magnum opus. A.W. Moore, citing Bernard Williams's criteria for a great thinker, ranks Deleuze among the "greatest philosophers". His work has influenced a variety of disciplines across philosophy and art, including literary theory, post-structuralism and postmodernism. He married Denise Paul "Fanny" Grandjouan in 1956. Like many of his contemporaries, including Sartre and Foucault, Deleuze was an atheist. Deleuze, who had suffered from respiratory ailments from a young age, developed tuberculosis in 1968 and underwent a thoracoplasty (lung removal). He suffered increasingly severe respiratory symptoms for the rest of his life. In the last years of his life, simple tasks such as handwriting required laborious effort. On November 4, 1995, he committed suicide, throwing himself from the window of his apartment. Like Kant and Bergson, Deleuze considers traditional notions of space and time as unifying forms imposed by the subject. He therefore concludes that pure difference is non-spatio-temporal; it is an idea, what Deleuze calls "the virtual". (The coinage refers to Proust's definition of what is constant in both the past and the present: "real without being actual, ideal without being abstract.") While Deleuze's virtual ideas superficially resemble Plato's forms and Kant's ideas of pure reason, they are not originals or models, nor do they transcend possible experience; instead they are the conditions of actual experience, the internal difference in itself. "The concept they [the conditions] form is identical to its object." A Deleuzean idea or concept of difference is therefore not a wraith-like abstraction of an experienced thing, it is a real system of differential relations that creates actual spaces, times, and sensations. Thus, Deleuze at times refers to his philosophy as a transcendental empiricism (empirisme transcendantal), alluding to Kant and Friedrich Wilhelm Joseph Schelling. In Kant's transcendental idealism, experience only makes sense when organized by forms of sensibility (namely, space, and time) and intellectual categories (such as causality). Assuming the content of these forms and categories to be qualities of the world as it exists independently of our perceptual access, according to Kant, spawns seductive but senseless metaphysical beliefs (for example, extending the concept of causality beyond possible experience results in unverifiable speculation about a first cause). Deleuze inverts the Kantian arrangement: experience exceeds our concepts by presenting novelty, and this raw experience of difference actualizes an idea, unfettered by our prior categories, forcing us to invent new ways of thinking (see below, Epistemology). Simultaneously, Deleuze claims that being is univocal, i.e., that all of its senses are affirmed in one voice. Deleuze borrows the doctrine of ontological univocity from the medieval philosopher John Duns Scotus. In medieval disputes over the nature of God, many eminent theologians and philosophers (such as Thomas Aquinas and Arjun Jain) held that when one says that "God is good", God's goodness is only analogous to human goodness. Scotus argued to the contrary that when one says that "God is good", the goodness in question is exactly the same sort of goodness that is meant when one says "Jane is good". That is, God only differs from us in degree, and properties such as goodness, power, reason, and so forth are univocally applied, regardless of whether one is talking about God, a person, or a flea. In ethics and politics, Deleuze again echoes Spinoza, albeit in a sharply Nietzschean key. In a classical liberal model of society, morality begins from individuals, who bear abstract natural rights or duties set by themselves or a God. Following his rejection of any metaphysics based on identity, Deleuze criticizes the notion of an individual as an arresting or halting of differentiation (as the etymology of the word "individual" suggests). Guided by the naturalistic ethics of Spinoza and Nietzsche, Deleuze instead seeks to understand individuals and their moralities as products of the organization of pre-individual desires and powers. In the two volumes of Capitalism and Schizophrenia, Deleuze and Guattari describe history as a congealing and regimentation of "desiring-production" (a concept combining features of Freudian drives and Marxist labor) into the modern individual (typically neurotic and repressed), the nation-state (a society of continuous control), and capitalism (an anarchy domesticated into infantilizing commodification). Deleuze, following Karl Marx, welcomes capitalism's destruction of traditional social hierarchies as liberating, but inveighs against its homogenization of all values to the aims of the market. In a 1990 Postscript on the Societies of Control, Deleuze claims that institutions and technologies introduced since World War II have moved social coercion and discipline from only physical enclosures (such as schools, factories, prisons, office buildings, etc.) into the lives of individuals considered as "masses, samples, data, markets, or 'banks'." The mechanisms of modern "societies of control" will be continuous, following and tracking individuals throughout their existence via transaction records, mobile location tracking, and other personally identifiable information. In the 1980s and 1990s, almost all of Deleuze's books were translated into English. Deleuze's work is frequently cited in English-speaking academia (in 2007, e.g., he was the 11th most frequently cited author in English-speaking publications in the humanities, between Freud and Kant). Like his contemporaries Foucault, Derrida, and Jean-François Lyotard, Deleuze's influence has been most strongly felt in North American humanities departments, particularly in literary theory, where Anti-Oedipus and A Thousand Plateaus are oft regarded as major statements of post-structuralism and postmodernism, though neither Deleuze nor Guattari described their work in those terms. Likewise in the English-speaking academy, Deleuze's work is typically classified as continental philosophy. In Fashionable Nonsense (1997), physicists Alan Sokal and Jean Bricmont accuse Deleuze of abusing mathematical and scientific terms, particularly by sliding between accepted technical meanings and his own idiosyncratic use of those terms in his works. (But see above, Deleuze's interpretations.) Sokal and Bricmont state that they don't object to metaphorical reasoning, including with mathematical concepts, but mathematical and scientific terms are useful only insofar as they are precise. They give examples of mathematical concepts being "abused" by taking them out of their intended meaning, rendering the idea into normal language reduces it to truism or nonsense. In their opinion, Deleuze used mathematical concepts about which the typical reader might be not knowledgeable, and thus served to display erudition rather than enlightening the reader. Sokal and Bricmont state that they only deal with the "abuse" of mathematical and scientific concepts and explicitly suspend judgment about Deleuze's wider contributions. Webdeleuze - Courses & audio (French), (English), (Italian), (Spanish), (Portuguese), etc. "A hypertext glossary of Deleuzean/Guattarian terms" by Rob Shields and Mickey Vallee. "Deleuze extraviado en Norteamérica /Journal Politica Comun (U. Michigan)" by Alejandro Sánchez Lopera (2016).